Andante: second movement, Mozart Sonata K. 545 played on my Steinway, 1917, M.
My relationship to Mozart and his music began with the violin. At the Merrywood Music Camp in Lenox, Massachusetts, only a stone’s throw from Tanglewood, I encountered Eugene Lehner, first violist of the Boston Symphony when I played second violin in a string quartet. At the time, in 1960 I was simultaneously fiddling and tickling the ivories. Lehner, in his 50s at the time, danced around us with a warm smile, conducted as we played, cajoled, hummed, gestured in every which way to make us “sing” with warmth radiating through our very beings. He wanted each of us to give everything we had, and we did, slipping into a universe of imagination, inspiration and pure beauty. I’ll never forget the experience. At Performing Arts High School in the mid 60s, I had the unique experience of playing the first movement of Mozart’s piano Concerto in G, K. 453 at the Winter concert where a radiance flooded the stage creating a special ensemble between orchestra and soloist. It was my second Mozartean journey that followed my having studied the Mozart Sonata in D K. 311. Mozart became the staple of my practicing as I branched out following my years as a student at the Oberlin Conservatory. Once settled into my own studio apartment on W. 74th Street and Amsterdam, I selected the Sonata in A Major, K.331 composed uniquely in Theme and Variations form, with a culminating Ronda Alla Turca as the final movement. In my confined creative space that was dominated by an imposing Steinway grand, gifted by my father, I learned the Piano concertos in D minor, K. 466, and C Major, K. 525. From there it was on to learn and teach more of Mozart’s sonatas. The composer has always presented a special challenge for the performer. One cannot over pedal, or under pedal his music. The Alberti, “broken chord” bass must not sound monotonous or grinding, but supply a warm underpinning for an operatically spun melody, especially in Mozart’s slow movements. Certainly the impetus for playing Mozart in a molto cantabile style was aided by suggestions from Eugene Lehner and Lillian Freundlich. 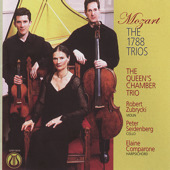 It has also been awe-inspiring to hear the composer’s trios played with a harpsichord instead of piano, creating a timbre, that perhaps Mozart intended. I’ve included a link to performances of this genre. In a word, I thank those who’ve helped me realize the spirit and soul of the Master’s music so that it’s realized in a style that is convincing and aesthetically pleasing. Eugene Lehner (1906 – 13 September 1997) was a violist and music educator. “Mr. Lehner, as he preferred to be addressed, was born in Hungary in 1906. Originally named Jenö Léner, he performed as a self-taught violinist from the time he was 7. When he was 13, the composer Bela Bartok heard him play, and arranged for him to pursue his studies formally. At the Royal Conservatory of Music in Budapest, he studied the violin with Jeno Hubay and composition with Zoltan Kodaly. 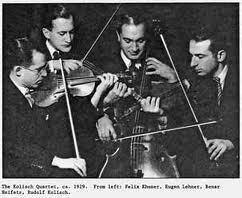 In 1925, soon after his graduation from the conservatory at 19, he joined the Kolisch Quartet. “Lehner was a violist with the Kolisch Quartet from 1926 until 1939, performed with the Boston Symphony Orchestra for 39 years (the only player to be invited to join without an audition by Serge Koussevitzky), and continued teaching chamber music at the New England Conservatory of Music and Boston University well into his retirement. Late in his life most coachings were given at his home in Newton. The modest upstairs room he coached in contained photographs covering every wall from all the quartets that he mentored – a real “wall of fame”. Lehner was widely regarded as one of the greatest living experts of the interpretation of chamber works by Alban Berg, Anton Webern, Arnold Schoenberg, and Béla Bartók, having been involved in the premieres of several of such works during his time with the Kolisch Quartet. As a member of the quartet, Lehner gave the premieres of Berg’s Lyric Suite, Schoenberg’s Third and Fourth String Quartets, Bartok’s Fifth Quartet and Webern’s Second Quartet. “When the Juilliard Quartet was formed, they spent a summer in intensive coachings with Lehner. He advocated playing string instruments with tempered intonation, in the spirit of Bach.